AboutAran.com: Singer Delia Murphy and her time on the Aran Islands. 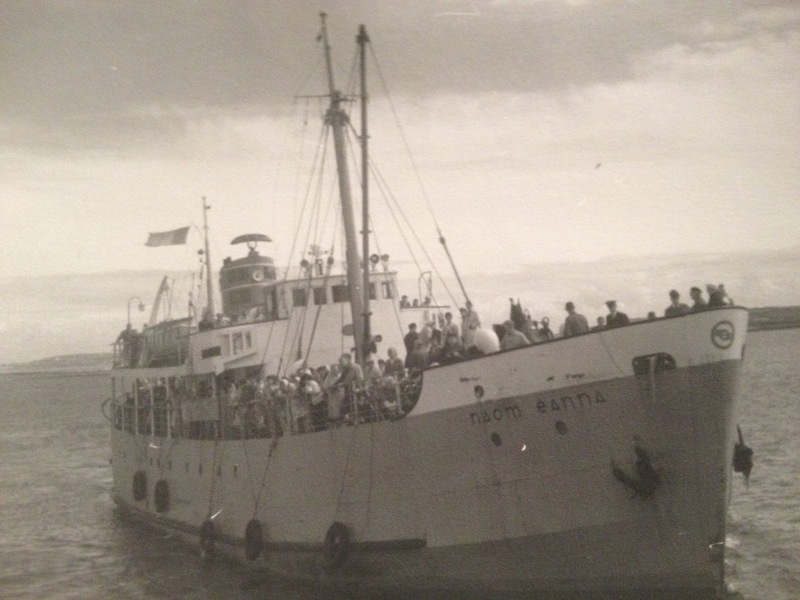 Singer Delia Murphy and her time on the Aran Islands. A happy photo of Delia Murphy, in Cill Rónáin in the 60s. 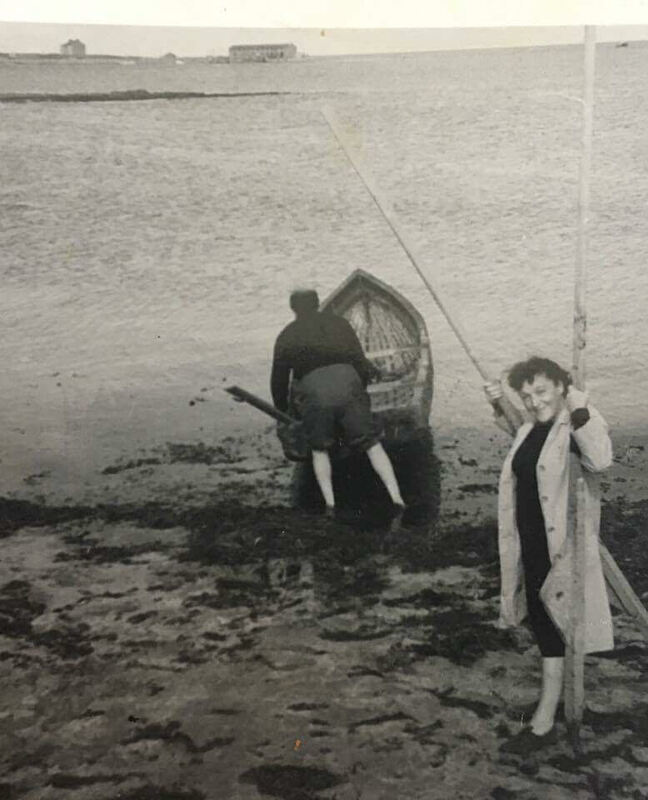 The singer Delia Murphy looks happy to be going to sea as Liam Redmond tends to the currach. Here is a lively photo of one of Ireland's most famous singers, Delia Murphy. A short time jigging for ronnach (mackerel) and mangach (pollock) around these shores, guaranteed plenty of fish for supper. The photo shows Delia, standing with the oars, as the well known actor Liam Redmond tends to the currach.The Redmond family were regular visitors to the island which they made their home on a number of occasions. Recently, happy days spent playing with the Redmond children, were recalled by an island woman who spent many a memorable hour with the family when they were renting the Carra house near Cill Rónáin. The family also on occasion rented a house near the top of An Chaircir Mhóir. Another view of the Carra House near Cill Rónáin with Inis Meáin deceptively pulled up close by the camera lens. 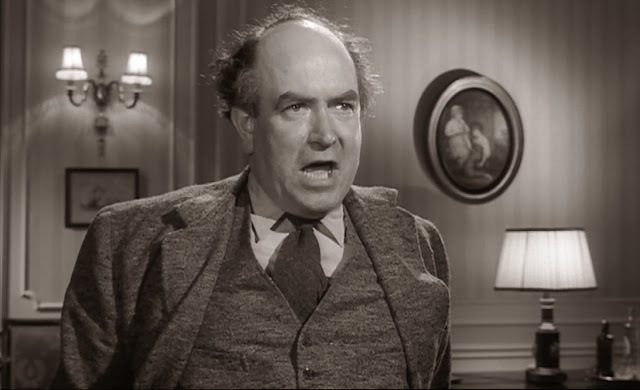 Liam was a very famous actor and some readers may recall seeing some of his stage or film performances. His wife Bairbre (1915 -1987) was a daughter of the executed 1916 leader, Thomas MacDonagh. Well known actor Liam Redmond (1913-1989). A regular visitor to Aran in the 50s and 60s. Can be seen tending to the currach in our main photograph, with Delia Murphy. Bairbre's mother Muriel, was one of the six radical Gifford sisters, two of whom lost their husbands in 1916. Muriel was drowned in 1917 and her sister Grace had married Joseph Plunkett, just hours before his execution. 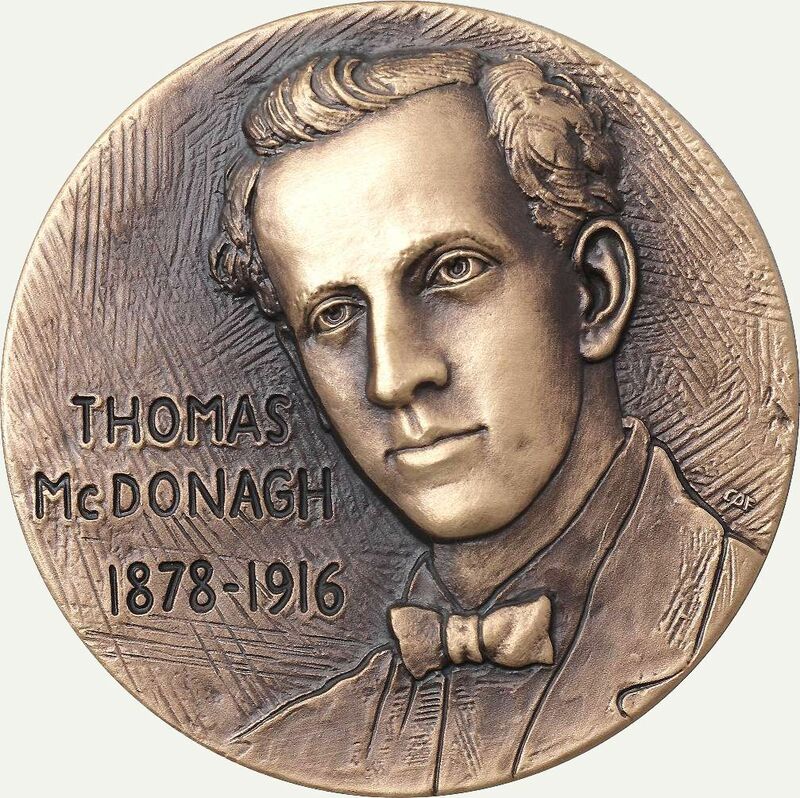 Bairbre Redmond's father, Thomas McDonagh. One of the sixteen men executed after the rising in 1916. Delia Murphy was a good friend to Bairbre and Liam and on occasion joined them on the island for a few days away from it all. We got the photo from a great friend of the islands, Peter Bryson from Co Derry, who along with parents P.J. and Kathleen and his family, has been visiting Aran for over sixty years. Peter has recalled travelling back to Galway on a packed Naomh Éanna, while Delia entertained the crowd with a succession of old favorites. The M.V. Naomh Éanna, where many a great music and song session was held. When the day was rough, the first roll, as the shelter of the land was lost, heralded a great evacuation from the bar as nervous passengers rushed for the open air. When the passengers disembarked in Galway, a chauffeur, whose music tastes, if he had any, didn't include old "Come all ye" tunes, approached Kathleen Bryson. With perfect diction he enquired “Excuse me madame, are you Delia Murphy”? Like the honest woman that she was, Kathleen directed him towards Delia. 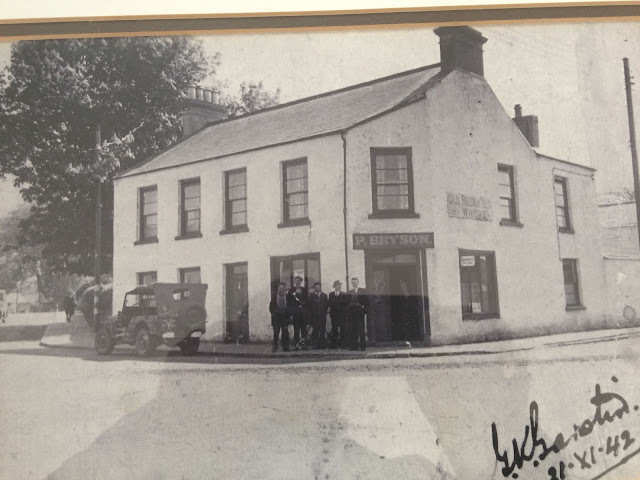 Brysons bar in 1942. Note the U.S. Army jeep parked outside. Ireland, North and South, benefited greatly from the large number of American and Canadian troops who were based here. Soldiers inside obviously had more important things to do than pose for a photo with the locals. 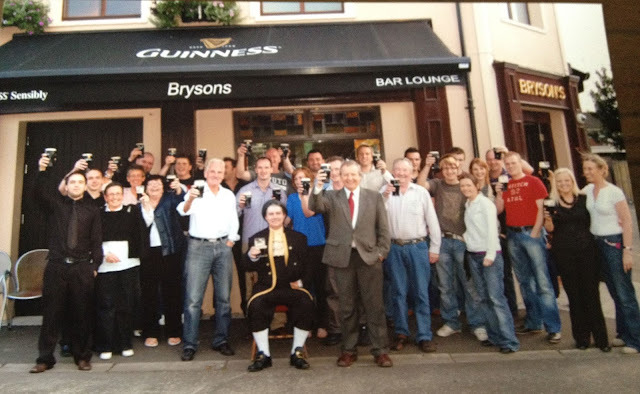 Brysons Bar and Restaurant today. Celebrating Arthur's day. Peter and his family run one of Ireland's most famous musical pubs, in the town of Magherafelt, Co Derry. If you are ever passing, drop in and say hello to the Brysons. Just mention the Aran Islands and you will get an endless supply of stories from long ago as you sample that great Derry hospitality. 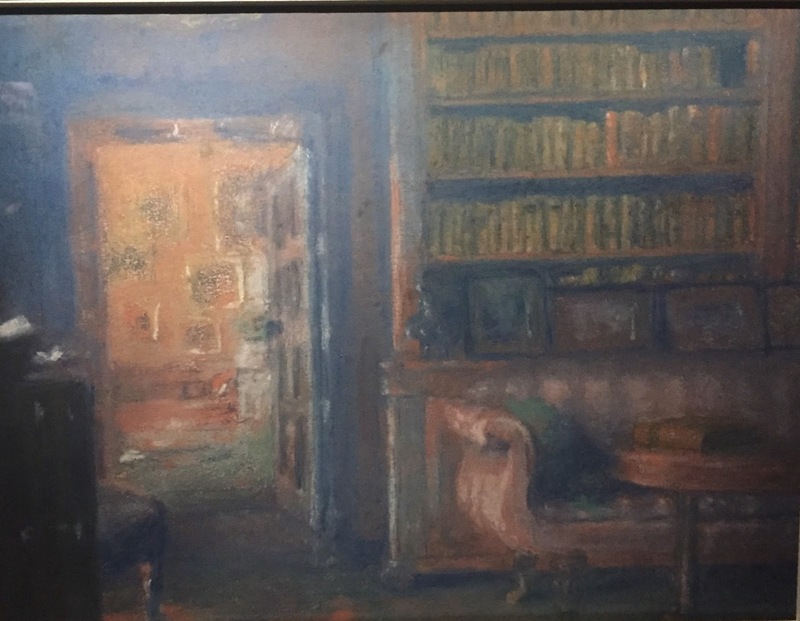 The library at Coole as painted by W.B.Yeats himself. Perhaps the very bookcase where he hunted down Anthony Trollope, for some bedtime reading. Liam Redmond is credited with recording a great story that Delia once told him. It seems Delia and her husband Thomas Kiernan, were guests of Lady Gregory at Coole park near Gort. The great poet W.B.Yeats was also present. As bedtime approached, W.B. started to go through the bookshelf looking for some reading material. Muttering aloud to himself he declared “ I always find that a little Trollope helps me to sleep”. Lady Gregory was not amused. We fairly quickly found out why the cottage was named The Whistling Duck! There is indeed such a flying feather friend on the island!